Like I always say .. a lot can happen in a week. Or even days. What was shaping up to be a very attractive auction today – creating a 9-year, 10-month Treasury Inflation-Protected Security – has turned a bit sour. On Wednesday, the August inflation report became a deflation report, with prices dipping 0.1% for the month. Deflation isn’t a good thing in the TIPS market, and that sent the TIP ETF dipping below my long-watched $110 level. The yield on a 10-year TIPS hit 0.73%, highest of the year. But the deflation news bolstered spirits for the Federal Reserve’s interest rate ‘doves.’ On Thursday, the Federal Reserve put off raising short-term interest rates, which have been set at near-zero for nearly seven years. And the TIPS market cheered. The yield on a 10-year TIPS dropped 10 basis points, to 0.63%. Today’s auction is a reopening of CUSIP 912828XL9, with a coupon rate of 0.375%. Bloomberg’s Current Yields page shows it is trading this morning with real yield to maturity of 0.58% and a price of about $98 for $100 of value. The Wall Street Journal’s Closing Prices page shows this TIPS ended Thursday with yield of 0.604% and a price around $97.50. 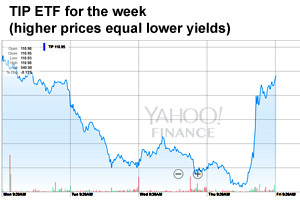 The TIP ETF opened up this morning — it is up more than 1% in two days. That means lower yields. That one day delay – costly for investors, great for the Treasury. If this TIPS had been auctioned at its normal time, closing at 1 p.m. Thursday, it would have generated a real yield of about 0.75% – the highest number in more than four years of 9- to 10-year TIPS auctions. Instead, it will now go off somewhere around 0.58% — 18 basis points lower. It will cost investors more than 1% more than it would have 24 hours ago. This TIPS closed Wednesday with a price of about $96.69. Today’s price could be right around $98. Although I already have a small investment in CUSIP 912828XL9, I’ll be skipping this auction. This TIPS will be reopened one more time – in November.